We discovered this delicious sauce at the Morro Bay Music Festival this summer, and it has become our go-to sauce for grilled pork chops. Unbelievably delicious! Next we're going to try it in our favorite recipe for chili--black bean pork tenderloin chili in the Crock Pot. No doubt it will take that chili from the best to award-worthy. "Wow," was my first impression upon tasting this delicious concoction. This impression quickly changed from great to amazing as the smoky aftertaste clung to my mouth. If you're like me, you have spent countless hours and seperate sauce tastings to find just the right flavor for you. I met a Black Sheep salesman at a local vendor stall event on the Central Coast in California. He could tell I knew what I was looking for and he asked for not the flavbor, but the sensation I was looking for. I explained my quest for the perfect sweet, tangy combination. He immediately picked up the Smoky Mountain Apple-Chipotle and insisted I try a sample. At first I was skeptical, after tasting so many flavors in my search it was hard to believe I would ever find it. The initial flavor was extremely good, but wasn't the exact flavor I had dreamt of. This feeling only lasted 2 seconds however, as the second wave of flavor washed over me. 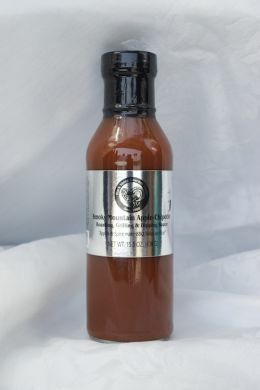 While my tasting searches have not come to an end, my quest for the perfect sweet and tangy sauce for myself has. Thank you Black Sheep for this great sauce, and expect me to buy another bottle (or two) as soon as this one runs out.